Streets crews work from 7:00 a.m. - 3:30 p.m. Most issues listed below should be reported to the Engineering & Public Works Department at (865) 273-3302. ​Click the links below for additional information. To go to the Traffic Operations page (traffic signals and other information) click here. Please call (865) 273-3302 to have hazards removed from a City street. Street Signs are maintained by the Streets Division & Sign Shop. Downed or damaged Stop Signs are considered an EMERGENCY. Please report it immediately to us (865) 273-3302 from 7:30 a.m. - 4 p.m. or call 911 after hours. Any problems with other street signs should be reported to (865) 273-3302. No posters can be attached to local, state or federal street, road, or highway signs. ​How do I get a pothole in the road repaired? How do I get a crack in the pavement sealed? Or get a curb that is cracked and broken repaired? Please call (865) 273-3302. The Street Division will investigate and return your call with the results. Curbed streets (only) are swept in the City limits. The process takes 5-6 weeks to sweep all curbed streets inside the City. ​For more information or to find out the schedule for your street, contact us at (865) 273-3302. To report a clogged ditch, basin, tile/ culvert, call (865) 273-3302. We will investigate the issue and follow up with the reporting citizen. What is the street repaving process? Engineering and Public Works has a 3 year paving list for City streets to be paved for the upcoming 3 years. The regular grade will be evaluated for overall condition and adjusted according to priority of streets. For more information, please call (865) 273-3500. Obstructed sight distance issues (trees, shrubs, fences, etc which block safe sight distance for motorists) may be reported to (865) 273-3302. The City's ordinance for sight distance at intersections and along public roads (Ord. #2010-06 Ch.16-103) can be found here. Sight distance issues will be evaluated by the Engineering and Public Works Department on a case by case basis. 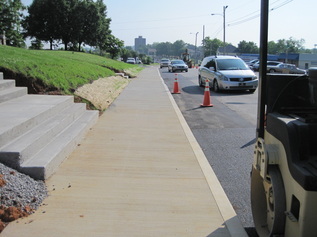 The Streets Division installed 1250 feet of new sidewalk from W Broadway Ave to South Cedar Street and widened Broadway three feet.